Embassy Suites by Hilton Scottsdale Resort is a hotel wedding venue located in Scottsdale, Arizona. This newly renovated hotel venue offers a fresh, modern backdrop to enhance your upcoming wedding or other special event. 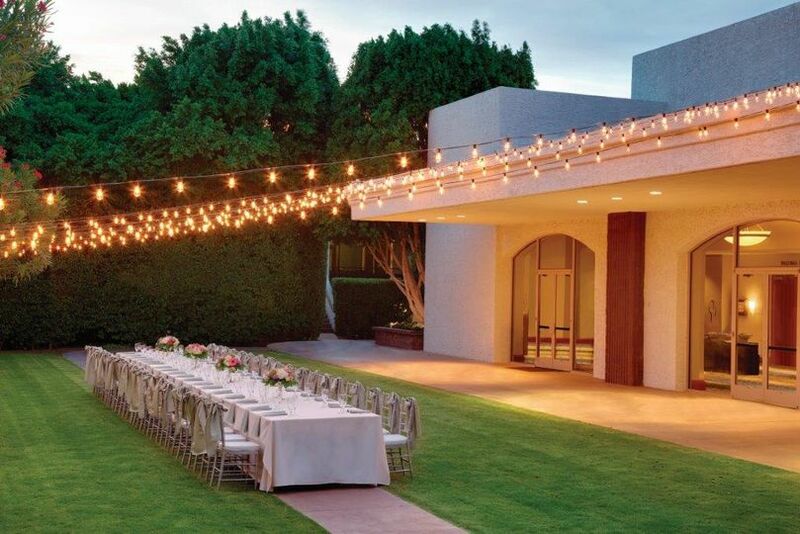 Embassy Suites by Hilton Scottsdale Resort is the perfect place to host a wedding, corporate event, or social event. With excellent accommodations, gorgeous event spaces, and useful amenities and services, this could be the venue you've been searching for. Embassy Suites by Hilton Scottsdale Resort is a newly upgraded venue that has over 60,000 square feet of indoor and outdoor event space. The main ballroom offers an elegant location to host an event with up to 1,400 guests. There are a variety of large and small event spaces, which are flexible and versatile to suite all types and sizes of events. There are also two onsite restaurants and two lounges that can help to enhance your overall experience at the hotel. I can't begin to describe how wonderful all of the staff (except for ONE front desk girl) was during every process of planning and executing my wedding! I originally was working with one person who is no longer at the hotel. When she decided to take a position at a different hotel, after being at Chaparral Suites for over 20 years, she took the time to inform me herself that she was no longer with Chaparral Suites. She even provided me with her personal phone number in case I had any questions about anything, since at the time no one had stepped in to take her place, and no one had taken over her role yet. Even though she is no longer there, I feel this shows the type of people they employ; caring and thoughtful people who truly want to make your day and experience with the hotel a pleasant and positive one! After that phone call I was nervous but optimistic that someone great would fill the previous coordinator's shoes, and great does not even being to describe Shelley Brown!! After my first phone call with Shelley my mind was at ease. I knew she was going to make sure mine and my husband's day fantastic! Shelley was always available to answer any and all of the questions I had. She made sure everything was perfect from the linen colors to the cake, from the ceremony set up to the room my husband and I stayed in on our wedding night. She's been in the wedding business for over 20 years and knows her stuff! Shelley is professional but personable. She's friendly and makes the stress of planning a wedding fun. I couldn't be happier that Shelley came into our lives at such an important time and played such an important role in our wedding! To say Shelley was an absolute delight to work with is an understatement!! The catering department was easy to work with and anxious to please. This place was AMAZING. They graciously worked with me since I wanted to create my own menu. Then the chef took my menu and made it out of this world. I have never seen so much food. It was beautifully displayed and everything was so delicious. I received so many compliments that it was best wedding reception they had ever been to. I attribute that to the wonderful job everyone did there!!! I highly recommend this place to everyone I know getting married!! !